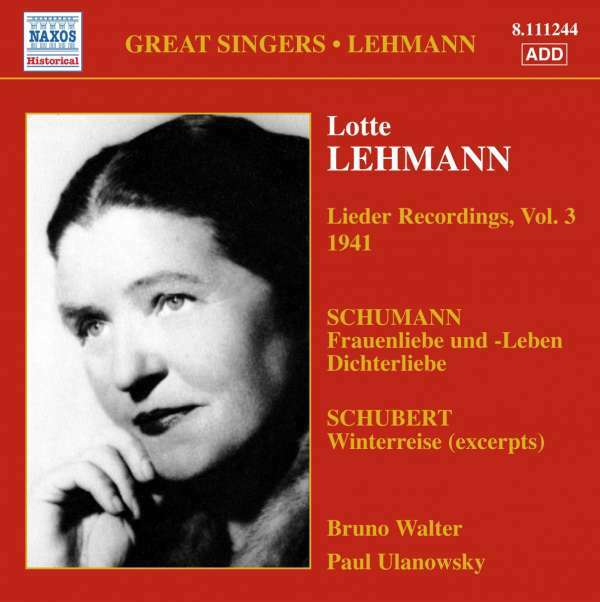 Der Artikel Lotte Lehmann - Lieder Recordings Vol.3 wurde in den Warenkorb gelegt. By 1941, in her fifties, Lotte Lehmann was gradually winding down her illustrious operatic career. Noted for following her own musical and interpretative inclinations rather than obeying stylistic fashions, the long-serving soprano was still very active in the field of Lieder, particularly with Bruno Walter as her accompanist. With her impassioned delivery, warm tone, telling word-paintingand occasional use of portamento, Lehmann makes her own very personal yet utterly compelling case for Schumann's Frauenliebe und -Leben and Dichterliebe. In the excerpts from Winterreise, for many years the province of male singers, she offers a bold, romantic reading that identifies both with the bleak setting and the protagonist's awful situation. 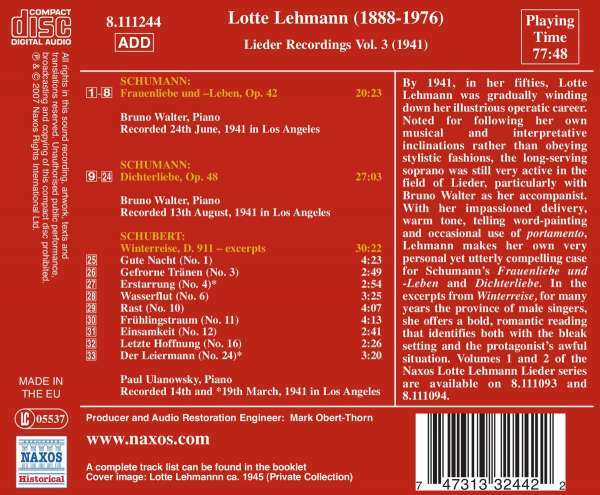 Volumes 1 and 2 of the Naxos Lotte Lehmann Lieder series are available on 8.111093 and 8.111094. Hörprobe Track 12: Dichterliebe, Op. 48: No. 4. Wenn ich in deine Augen seh'! Dichterliebe, Op. 48: No. 4. Wenn ich in deine Augen seh'!